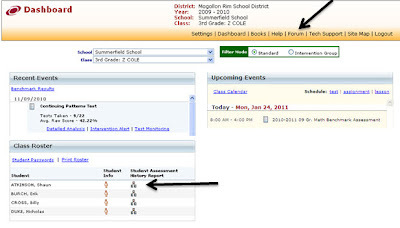 What is the easiest way to access all the assessment data for one of my students? While Galileo provides users with many reports that may be run on individual students, the most popular and most inclusive of these reports is the Student Assessment History Report. Where do I find the Assessment History report? The Student Assessment History may be accessed from a number of places in the Galileo application. Generally teachers find it easiest to access the Assessment History from the Class Roster on the Dashboard page. The Assessment History Report displays assessment data for all the years and tests (benchmark, formative, and external) that the student has taken. It allows the teacher to see how students did on previous tests and to what degree they have mastered other grade-articulated standards. You may access the Individual Profile report and the Student Benchmark Profile page for the selected student. Great news for all Head Start programs utilizing Galileo Pre-K Online. If not already a participant, you are invited to become a participant in the 2011-2012 expansion of the Head Start Portrait of Child Outcomes. The Portrait, initiated several years ago by Head Start programs throughout the nation, is a grass roots initiative in collaboration with Assessment Technology Incorporated (ATI) in which Head Start programs join together, pool their data, and share information with the public. The portrait creates a vehicle to showcase the success of Head Start in promoting children's learning and development and thus to also showcase success in fostering their school readiness skills. The 2011-2012 Portrait will reflect children's ongoing learning and progress in the 11 Domains and 37 Domain Elements comprising the Head Start Child Development and Learning Framework. Portrait data are automatically recorded online by Head Start programs and are available in real-time for reporting purposes. Thus, there is a unique opportunity to provide the Head Start community, researchers, policy-makers and the public with a continuous and changing portrait of outcomes reflecting the course of children's learning throughout the program year. To participate, click here for the registration form, and return completed form to ATI. Participation in the Head Start Portrait is completely voluntary. There is no cost or additional work involved in becoming a Portrait participant. For more information, click here, contact an ATI Field Services Coordinator at GalileoInfo@ati-online.com or call 1.877.358.7611. A well-designed comprehensive assessment system includes different types of assessments to serve the needs of students from preschool to grade 12. The Galileo K-12 Online next generation comprehensive assessment system is part of a fully integrated, standards-based instructional improvement system, offering comprehensive instructional and assessment tools. Changes the way assessments are used in education by providing increased information to guide instructional decision-making. Places results from a variety of assessments on a common scale. The use of a common scale makes is possible to directly compare results from different assessments, offering a more complete picture of academic accomplishments. Increases assessment efficiency. In the Galileo K-12 Online comprehensive assessment system, a technology platform common across assessment types is developed to facilitate implementation of the system. The platform includes artificial intelligence routines that guide the construction, review, publication, security, scheduling, administration, and scoring of tests, plus psychometric analyses, reporting, and the provision of actionable decision options. Provides system monitoring tools making it possible to guide system implementation. These tools include information regarding when tests have been constructed, reviewed, revised, and delivered. Monitoring information also provides data on the extent to which different types of assessment are used. This information can be used to guide a customized assessment plan. Galileo K-12 Online assessments and reports accurately forecast student performance on statewide assessments. Galileo K-12 Online assessments are reliable and provide consistent estimates of student ability. Galileo K-12 Online reports indicate whether adequate growth rates were achieved within each district, school, or classroom. Galileo K-12 Online Hierarchical Linear Modeling (HLM) analysis and reports support Instructional Effectiveness initiatives. Colorado Association of School Executives (CASE) 12th Annual Winter Leadership Conference February 2 and 3 at the Westin Hotel, Westminster, Colorado. Colorado League of Charter Schools (CLCS) 18th Annual Conference February 23 and 24 at the Omni Interlocken Resort, Broomfield, Colorado. California Charter Schools Association (CCSA) 19th Annual Conference February 27-March 1 at the Sacramento Convention Center, Sacramento, California. Watch for details about the upcoming Common Core webinar to be hosted by WestEd and Assessment Technology Incorporated on February 29.